Have you ever wonder what the feeling would be while being surrounded by electricity? Electric Dress (1956), the work by Atsuko Tanaka, is a combination of modern technology and traditional culture. The Electric Dress is an early work of wearable art. It is made of electrical wires and hundreds of coloured neon light bulbs, painted with primary colours by enamel. The dress is actually the traditional Japanese kimono for marriage (although some people thought it looks like Christmas tree). Tanaka wore this work in exhibitions and walk through the exhibition hall. The light bulbs will be flicker according to body’s circuitry. The concept of this work is combining traditional Japanese kimono and innovative technology. At first when I seen this work, I thought it was an installation. It’s because it is made of several light bulbs, and I didn’t thought that electric bulb can be wearable. But after I have done research on the work, I knew that it is not a simple installation, it is wearable. This innovative idea had made this work became well-known. Atsuko Tanaka (1932-2005) is a Japanese avant-garde artist, born in Osaka. She was also a member of Gutai group, an avant-garde artists’ movement, found in 1954. The aim of the Gutai group was to break the boundaries between art and life in post-war Japan. They intended to eliminate the horrors away. Tanaka’s purpose was to get as close as possible to the materials used in the work, and even permeate into it, although there was danger of being electrocuted. After the post-war period of Osaka, new technology is being invented. Tanaka wanted to transmit the idea of post war Japan’s rapid transformation and urbanization throughout the work. The sparkling of the light bulbs could be a symbol of fresh, hope and shining start. Apart from the new technology development, the work also remained people do not forget the tradition. Her presentation of traditional feminine fashion is outstanding in the prehistory of feminist art. The meaning of the group Gutai is embodiment, meaning mixing up art and life. Gutai’s aim to “go beyond the borders of existing art”. The motto of the Gutai is “create things that have never existed before.” The work, “Electric Dress” had achieved both of these. For embodiment, the work is using a concept of Japanese kimono, which is a traditional and well-known traditional cloth of Japan. When audience viewing the work, they would have a kind of consensus. As the artist is Japanese, so Japanese would normally be the most frequent audiences of the work. Besides, Tanaka would wear the work in the past exhibitions; it shows that art can mix with human life. On the other hand, this work is a very innovative work at that period, which matches with the motto of the Gutai. Gutai encourage artists never imitate. 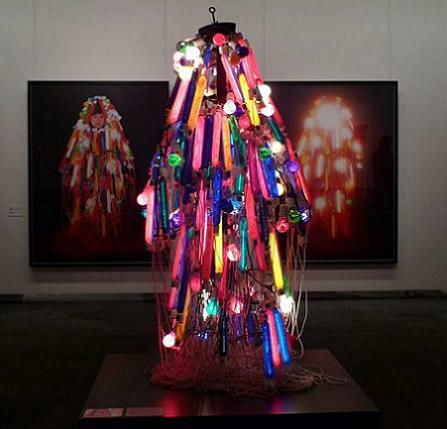 There may be people think of using light bulbs for art, but not for clothing. Beside as a tool of performance, the work itself is already a piece of artwork. In nowadays exhibitions, “Electric Dress” is no longer being worn by somebody, while just being display like an installation, but it inspiration still lasting until today. The function of “Electric Dress” as a wearable art is quite different from traditional wearable art. It is not made use of material for normal clothing. Instead of the function of wearing, it is more concerned to be a stage cloth for performance. This kind of performance wearable art can arduously be wearing for daily movement. Some example of wearable art for performance include “TV Bra for Living Sculpture” (1969) by Nam June Paik and Charlotte Moorman and “Hysterical Bubble” (2010) by Anja Hertenberger. Innovative is very important for new media artwork. Electric Dress is really creative. Besides, I appreciate the motto of Gutai group very much. I think it is really important for an artwork to be not being existed before. If the work planned to create is already existed in the world, I think there would be no point to create it again. This work combined new technology and tradition. I also love this point very much. It is true that the technology is being rapidly developed, but I think we still should not forget about the past and the tradition. The history is the provenance of development. Without the past, there will not be future. Thus, I think the idea of Electric Dress on combining the tradition and innovation demonstrate the progress of development, while not forgive the past; all technology are develop based on the past. The last thing I would like to say is, one of the reasons for this work to be so long existed, I think, is because this work is somehow “very Japanese”. Although it made use of advanced technology, the foundation is still based on the very traditional stuff – kimono. As kimono is world-wide known traditional Japanese clothing, it makes the Electric Dress to be very outstanding as a Japanese artwork, as kimono could basically equal to symbol of Japan. Therefore, people could recognize this is a Japanese work easily, and made the work to become so renowned, especially in Japan. In conclusion, “Electric Dress” is an innovative work at the 20th century, and the reason for “Electric Dress” to be so influential is that, it achieved the point that most performance artwork cannot do, that is maintained its power for decades.